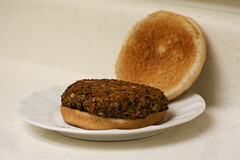 Chimpanzee Tea Party: Are Veggie Burgers No Longer Lame? I think that pretty aptly and succinctly describes the situation facing anyone ordering a veggie burger for as long as I can remember. Since I eat meat, I've always been more likely to order a veggie burger with cheese and a couple of slices of bacon (aka The Hypocrite), but even I know that... unless the place is well know for making their own patties in house... a vegetarian is best ordering anything else on the menu. So what does Gordinier say has changed? If there is a primary reason they are improving, it comes back to the force that drives just about anything in the marketplace: demand. According to Mintel, a market research firm, there was a 26 percent increase in menu items labeled vegetarian or vegan between the last quarter of 2008 and the same quarter in 2010. With more and more people pledging themselves to vegan and vegetarian modes of dining, it seems self-defeating for restaurants to ignore them — or to pretend that those diners will be satisfied with yet another droopy grilled-vegetable platter. The signs are clear enough that two high priests of the global burger gospel, Burger King and McDonald’s, have for years given veggie burgers a run, although only Burger King currently has one on menus in the United States. But with thousands of flora-based recipes in the world, why the compulsive return to the burger genre? “There’s something really satisfying about a hand-held food that’s served on a bun,” said Lukas Volger, the author of “Veggie Burgers Every Which Way,” a cookbook that was published last year. The patty-bun-condiments format of a burger holds sway over us the same way the dependable verse-chorus-bridge structure of a perfect three-minute pop song does. I guess I've just never had a good veggie burger... and because I eat meat, I still can't help but feel like they're a waste of time. There are so many better things to do with vegetables... that aren't simply aping a meat dish that they can never really even vaguely resemble... that I have trouble believing that improving them is worth the effort. Now granted, I love me some falafel and vegetable fritters... and what are they, really, other than mini-veggie burgers? So I guess I'll have to take my pessimistic self and try the supplied recipe or... at the very least... one of the house made options in Cambridge (topped with bacon and cheese naturally)... and see if I can be made a believer.